Having brought a cinematic style to TV series such as Charlie Brooker's Dead Set and Criminal Justice for the last few years, it's surprising that it's taken so long for director Yann Demange to make the jump to feature films. 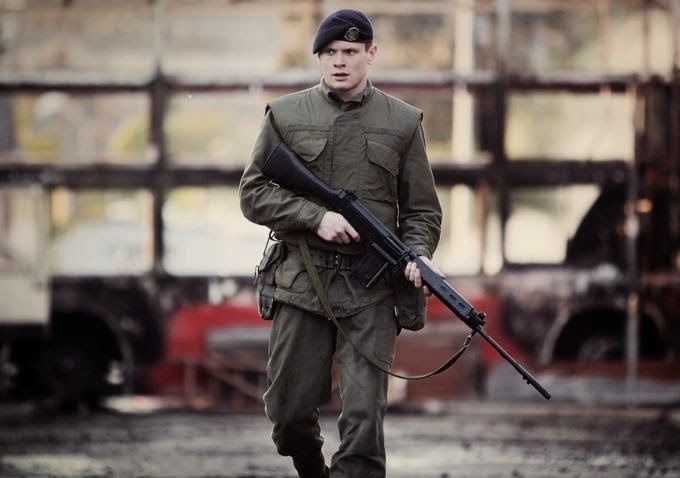 '71, starring the seemingly unstoppable Jack O'Connell as a squaddie in the worst situation imaginable, is well worth the wait. In 1971, Gary Hook is a private straight out of training in the British army. His platoon is dispatched to Belfast on "an emergency basis" to back up the local garda in raiding a suspected hiding place for weapons. When violence erupts between the army and the locals, Gary and another soldier are separated from the platoon and left behind. Gary soon finds himself alone and surrounded by republicans who want his blood, as he makes a desperate attempt to get back to the safety of his barracks. There's a canon of Troubles movies such as In The Name Of The Father, Bloody Sunday and more recently, Shadow Dancer, but surprisingly and yet wisely, '71 doesn't aspire to them as much as it takes the harrowing, realistic setting as the background for a nerve-racking thriller. 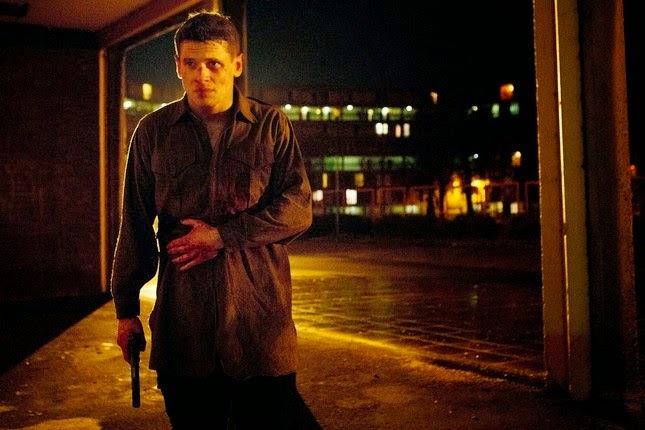 As in the excellent Starred Up, much of the film rests on Jack O'Connell's performance. Where we've previously seen him find enormous empathy in thugs and wayward youths, Demange and screenwriter Gregory Burke call on O'Connell's physicality, and his ability to express wrenching emotion in not so many words. Much of the setup is felt rather than told- we see Gary as the only person in the life of a young boy, who's slightly too old to be his son, but just the right age to be his little brother. He checks the kid into a beige and lifeless children's home on the eve of being dispatched to Northern Ireland, but his isolation in the no-Brit's-land between Falls Road and Shankill Road doesn't make for many teary speeches about how he has to get back home. Aside from that, contrary to all warnings from his superiors that his mission is "not abroad", he might as well have been dropped off on an alien planet for all of his understanding of the deteriorating situation in Belfast. Although it's not dwelt upon, Gary's paternal relationship back home is mirrored and contrasted with supporting characters like Barry Keoghan's Shaun, who is embroiled in stashing weapons for the older republicans, and a particularly excellent Corey McKinley as a foul-mouthed unionist kid who encounters Gary at the earliest point of his vulnerability. It seems like even the community in which this feud is taking place can be mobilised against the foreign element, as seen from the chilling and disturbing riot scene that gets Gary separated from his unit, to the rain-soaked, pulse-pounding climax. Demange brings cinematographer Tat Radcliffe and editor Chris Wyatt over from his television projects and their ongoing collaboration works like gangbusters. Radcliffe makes the most of a switch from film in the daylight scenes to a nocturnal digital look that glows orange like fire or lamplight, while Wyatt keeps the unforgiving tempo of the action scenes with brutal cuts in some places and lingering gazes in others. The piece de resistance is probably an unshowy but breathtaking tracking shot at the midpoint, in which Gary is utterly disoriented but the audience is unfalteringly aware that he's only getting himself more lost in the carnage. But this isn't a true story, even if there's a factual basis to the setting. 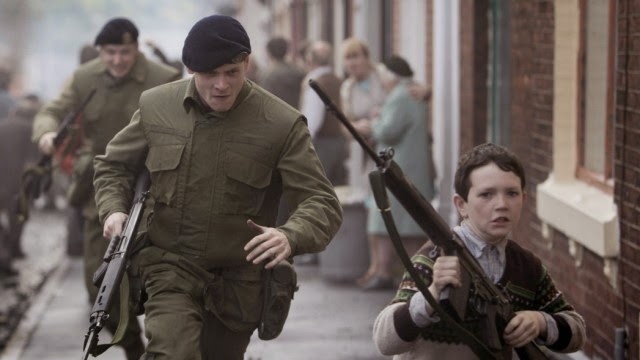 There's no easy answer to the conflict that is dramatised and no easy end-credits captions explaining that the Troubles wore on for decades longer before being instantly and permanently settled by the Good Friday agreement. The complications presented by Martin McCann's staunch Brit-hating republican, David Wilmot's duplicitous patriarch and Paul Anderson and Sean Harris' conniving British operatives will go on long after Gary's journey is done and the filmmakers don't pretend otherwise. '71 is a handsome thriller with a terrifying premise and an ugly reality to swallow down. Carried squarely on Jack O'Connell's shoulders, the tension never lets up from the first outbreak of violence, and any momentary respite is quickly coloured in by harrowing anecdotal detail and economical character building. In a thriller especially, the benefit of the story that is felt rather than told is that it mounts as a growing feeling of dread in your gut, and lingers in the mind long after the haunting final shot. '71 is now showing at cinemas nationwide. If you've seen '71, why not share your comments below? Die Hard comparisons abound, but it seems like we're unlikely to see '72/3/4/5 any time soon.